Some argue that there have always been reasons for despair. That times like these are no different than other very difficult days that have come before, so we should just shut up and get on with it. In the face of all this doom and gloom, we need to hold on to the hope that the future leaders of tomorrow will have the open minds and kind hearts to turn things around and do what’s best for this world for the times ahead. In the current society largely unconcerned what happens to its young people, it’s no wonder why they are increasingly feeling marginalised and as if they don’t have a voice. In Britain, this all is coupled with the long-standing tradition of ‘stiff upper lip’, making for an environment of anxiety and emotions, all bottled up and kept behind bedroom doors. We already know where that can lead to. Tom Chaplin’s debut solo album ‘The Wave’ chronicles how his life spiralled out of control while he tried to keep those emotions contained through drink and drugs. Thankfully, he found strength within himself to find help before it was too late. There’s a reason, too, why North West charity Campaign Against Living Miserably (CALM) was created: to reduce the shockingly high suicide rate among young British men who feel they can’t speak up about their pain because of the stigma of mental illness. On this side of the Atlantic, To Write Love on Her Arms was set up to similarly provide support young people with addiction and depression and connect them with the resources they need. As a former contributor to their publication CALMzine and having struggled with depression myself, I have great empathy for those who are suffering in silence, who feel like no one cares or will want to listen. Further, it pains me greatly that our children, who should be enjoying the most carefree time of their lives, are filled with anxiety and depression. So how do we build an environment where our youth feel safe to express how they are feeling and can do so without feeling vulnerable? A special place in East Yorkshire have done just that and one better, have also amazingly worked music into the equation. Going strong for over 2 decades, The Warren Youth Project in Hull is empowering young people aged 14 to 25 by supporting them be able to take control of their own lives. The independent, not-for-profit label Warren Records associated with the Project recently released the Three Minute Heroes album ‘#HearMeOut’, borne out of the Project’s partnership with schools in East Yorkshire, is hopefully the first in a long line to come. The album was part funded by The Joe Strummer Foundation and the Headstart Hull Partnership Programme led by Hull City Council. During Three Minute Heroes’ workshops in this region of England, students were guided and encouraged by mentors to share their feelings through creative, stream-of-consciousness writing exercises. Their words offer an honest, unfiltered peek into the minds and the thoughts that are troubling our youth, and they were turned into lyrics by local bands and singer/songwriters and incorporated into songs. What better way to encourage young people by showing first-hand how creativity through the sharing of emotions can lead to art that can reach and continue to inspire others? Musically, the LP offers the listener a wide variety of genres. On standout ‘Home’, alt-folk group The Mighty and the Moon tackle physical abuse and foster care, taking on the poignant subject matter with a thoughtful and deft hand. A folky vibe mixes with soul on ‘Paint a New Picture’ by Ruth Scott featuring Kristian Eastwood, conveying the sadness of a child growing up without his mother. Hillbilly Troupe’s ‘Dead Langer’ touches on the plight of the homeless, its catchy Americana rhythm not only propelling the track forward but also making the track memorable. False Advertising’s ‘It’s Been a While’ sums up the youth’s feelings of disconnectedness from society, their fuzz-filled rock the sonic equivalent of banging one’s head on a table in frustration. The further you go into the album, the more you come to emphathise with what our youth are struggling with in their own heads. The drawn out lyrics in Crooked Weather’s ‘Skeletons’ demonstrate the fight to silence your anxiety with what you intellectually know is the reality. Despite the resoluteness of the lyrics in The Dyr Sister’s ‘See, Hear, Speak’, the words come across as if they are said as mantras, not fully believed by their writer or fully realised. Yet. The handclaps on ‘I Want to Be Human’ by The Quicksilver Kings serve to punctuate the repeated moments that children feel when the adults in their lives aren’t taking them seriously. And there’s so much more on the ‘#HearMeOut’ album to discover. Young people today face so many obstacles and people telling them “no”, so it’s not surprising they feel unsupported and alone. The ‘#HearMeOut’ album is hopefully just the starting point for the Three Minute Heroes initiative. In raising awareness of mental health among youth and their providing a safe place for young people to voice what’s on their mind, it’s a natural extension of what The Warren Youth Project and Warren Records stand for. Let Three Minute Heroes serve as a fine example not just for in Britain, but for the world what can be achieved in supporting our children and with real, positive results. Three Minute Heroes’ ‘#HearMeOut’ album is now available to stream for free on Bandcamp and below. However, we here at TGTF encourage everyone to buy the limited CD at the minimum donation of £10 or more if you can spare it. All proceeds will go towards bringing the #HearMeOut campaign to more young people. You can also directly donate to Three Minute Heroes and The Warren Youth Project through here. 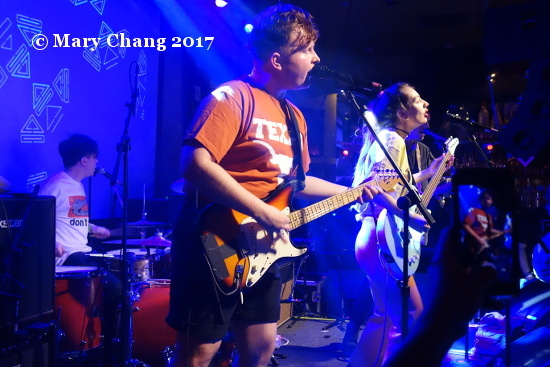 After our arrival in Austin on Monday afternoon, Mary and I officially began our music festival adventures at SXSW 2017 on Monday night at the Swan Dive, which played host to a showcase of alt-country and Americana artists. We only stayed long enough to see one band, but it turned out to be a fortuitous choice, as the first act on the evening’s bill was outstanding Finnish duo Tuomo & Markus. 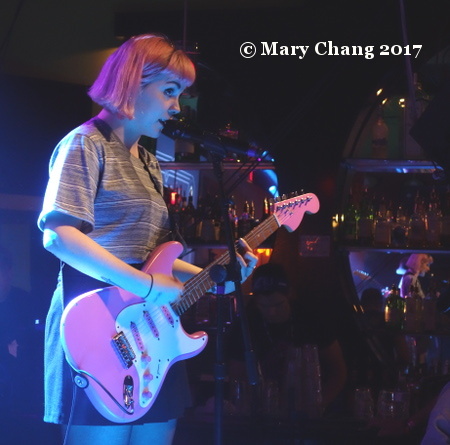 (Mary also wrote about them in this previous SXSW 2017 review post. Tuomo Prättälä and Markus Nordenstreng are each career musicians in their own right, but they came together recently at Wavelab Studio in my own adopted home of Tucson, AZ to record an album of contemporary Americana, with contributions from well-known friends, including members of Wilco, Calexico and The Jayhawks. Though the album, titled ‘Dead Circles’, has yet to be released outside of Scandinavia (its North American and European release is due later this year), I found out later in the week that Rolling Stone contributor David Fricke had already named it to his list of ‘New Albums from the Best of SXSW 2017’. Following Tuomo & Markus’ set, Mary and I set out in separate directions (you can read her Monday evening review here). I headed to The Gatsby, which was playing host to the heavily-hyped and well-attended Pandora showcase. After a brief wait in the queue, I got inside just in time to see another duo act, FRENSHIP, whom I’d already encountered in my preview of Los Angeles bands at SXSW 2017. James Sunderland and Brett Hite’s high energy blend of organic songwriting with electronic dance music is immediately captivating, and their anthemic tracks ‘1000 Nights’ and ‘Capsize’ fit perfectly on the large, brightly-lit stage at The Gatsby. You can hear more about FRENSHIP’s Monday night set in my post-performance interview with them right back here. The next act on the Pandora stage was Brooklyn-based dance pop band !!! (aka chk chk chk, if you want to say it out loud). They made an entrance worthy of all three exclamation points, and proceeded to shimmy and shake through a set that was equal parts glitz and Jazzercise. Their new album ‘Shake the Shudder’ is due out on the 19th of May, and if you love to dance, you’ll want to catch them on tour this summer: they already have dates scheduled in the UK and at home here in America. 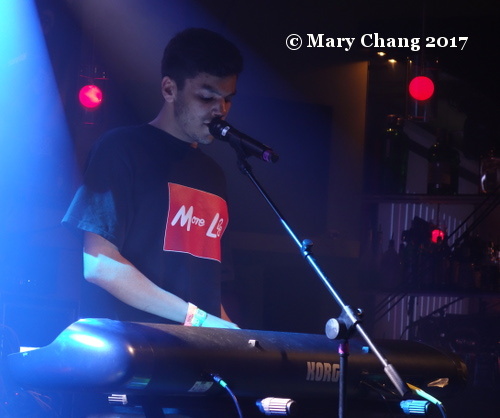 I’m not sure how I missed L.A. rock band Lo Moon in my aforementioned preview, but I was pleasantly surprised by their intense and atmospheric set on the Pandora stage. The video for their latest single ‘Loveless’ came out just after SXSW, and the drawn out anticipation of its slowly unfolding drama is a fair representation of their music, though they do make a much more powerful impact in live performance. Before the first night of SXSW could officially close, I naturally had to pay a visit to the British Music Embassy at Latitude 30. 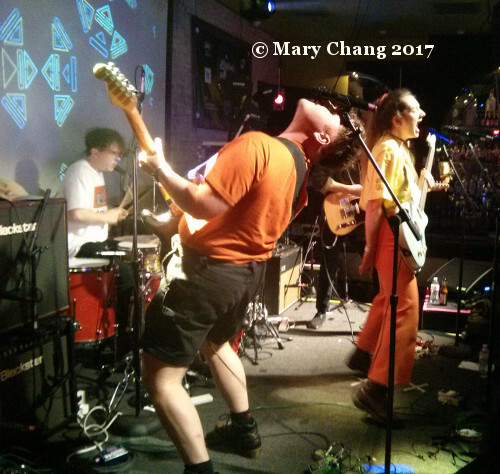 The last two bands on the DIY + TicketWeb showcase that evening were Manchester-based False Advertising and Exeter trio Muncie Girls. Both bands fall into the rock category, but False Advertisting were more on the fuzzy, grunge end of the continuum, while Muncie Girls have a brighter, cleaner sound. False Advertising do an interesting lead vocal/drums switch between Jen Hingley and Chris Warr, but as I was never able to see Warr’s face beyond his hair when he was singing, I think I’d have to say that I prefer Hingley in the forefront. Fellow frontwoman Lande Hekt of Muncie Girls had a more immediately engaging stage presence, though her pleasant smile was rather ironic, given the subversive lyrics behind her band’s catchy punk sound. 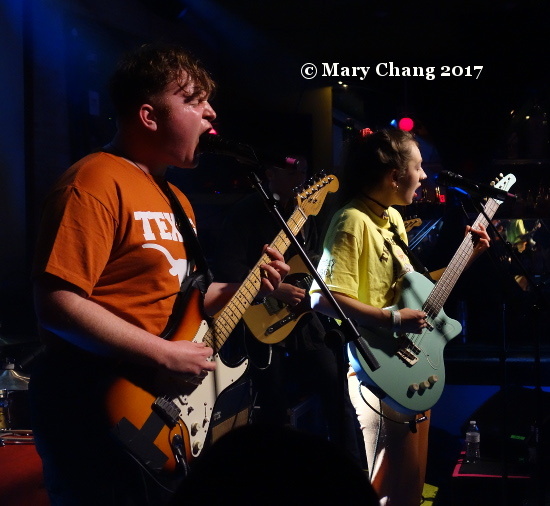 Monday night at SXSW 2017 was a grab-bag of different bands and different sounds, but it was only the tip of the iceberg. Stay tuned to TGTF for my further accounts from the week in Austin, and if you haven’t been able to keep up with Mary’s fast-paced coverage of events, you can find everything collected right back here. Manchester trio False Advertising had their American close-up last week during their first visit to Austin. 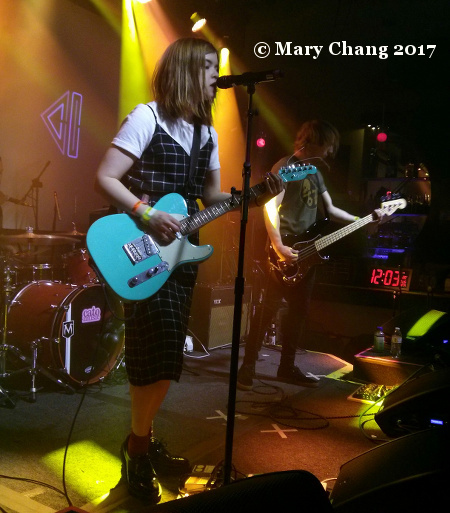 At SXSW 2017, they managed three high-profile evening shows, including starting things off right, performing at midnight at the DIY / Ticketweb UK showcase at where else but the British Music Embassy at Latitude 30. Considering who one of the sponsors of that show was, it seems entirely appropriate that their newest music video for ‘Not My Fault’ was entirely DIY by the band as well. Continuing on with the long line of punk-y songwriters eager to write music with conscience, frontwoman and guitarist Jen Hingley explains, “We wrote this song whilst lamenting the loss of opportunity and hope that this last year’s political developments have brought to a generation…Whilst the American election was reaching its gaudy climax a few months ago, I found myself more and more falling asleep on the sofa in-front of Fox News, absorbing some pretty exaggerated stuff. I wondered if by watching it, that it might break me out of my own bubble and make me a super well rounded person. But instead it just filled me with despair.” Well, if we’re going to be sad, we might as well rock out to it, yeah? Watch the quick-moving, motion sickness-inducing promo for ‘Not My Fault’ below. Stay tuned for our coverage of their appearance Monday night at the British Music Embassy, coming soon here to TGTF.